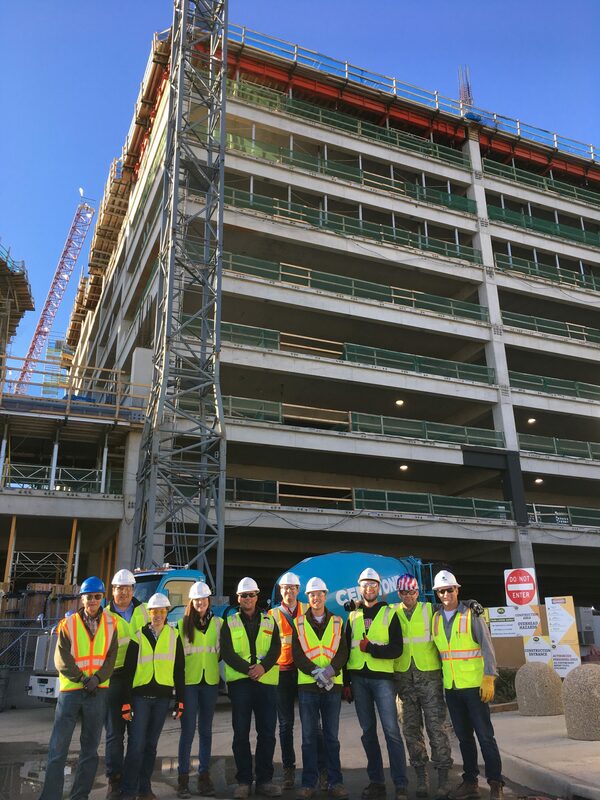 ■ Alleviate the steep and difficult learning curve for young structural engineers by providing seminars, workshops, and construction site visits. 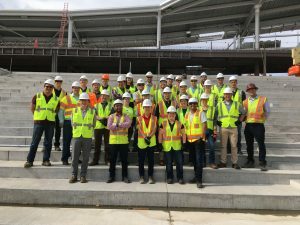 ■ Build a network among young professionals, both within the structural engineering industry and among other design and construction trades. ■ Provide opportunities to develop leadership and management skills by being a part of the YMG Committee. Members will be exposed to in-depth structural methodologies, latest technologies and applications, and presentations on lessons learned from past or ongoing projects. We aim to shape our members into more valuable structural engineers and to further educate them to advance their career. We invite all structural E.I.T.s and P.E.s (0 to 5 years of practice) to join and to become actively involved in this group. 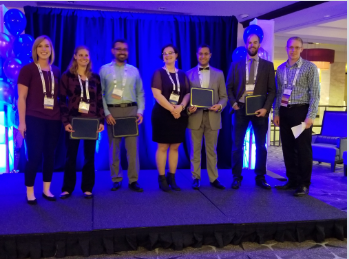 For the third year, an award was given recognizing an outstanding Young Member Group from one of the NCSEA member organizations at the NCSEA Structural Engineering Summit in Washington D.C. The emphasis of this award is to recognize Young Member Groups that are providing a benefit to their young members, member organization, and communities. In 2017, 11 Young member Groups (YMG’s) applied for the Young Member Group Chapter Award, 5 finalists were chosen to attend the Summit, and the MNSEA YMG was selected to receive the 2017 award. Congratulations to the committee and our members for their accomplishments and national recognition! Please email us at mnsea.ymg@gmail.com to get info about upcoming events. The Twin Cities Society of Hispanic Professional Engineers hosted its fourth annual “Noche de Ciencias”, or Science Night. 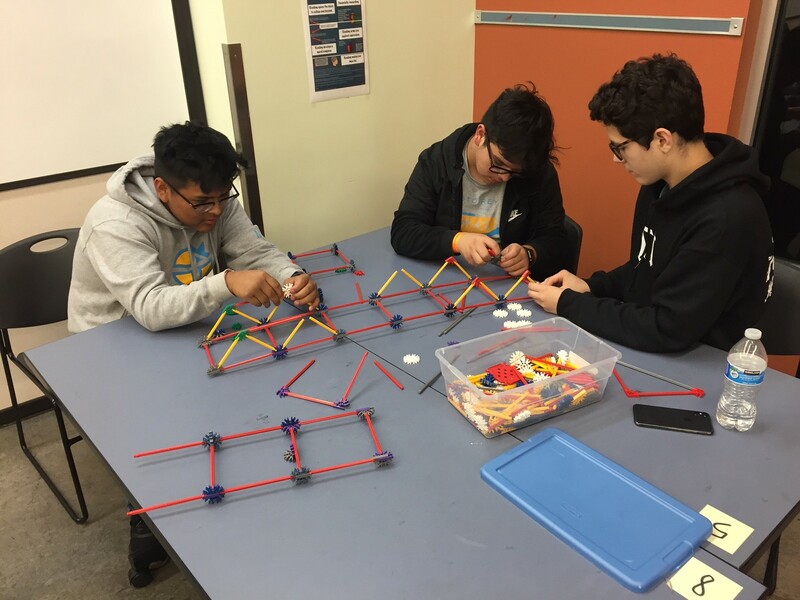 K-12 students got to interact with members of the local SHPE chapter, MNSEA YMG, several University SHPE chapters, and members of other volunteers in hands-on STEM activities. Parents were provided with college resources to help encourage their child(ren) to pursue higher education and STEM careers. Members of the MNSEA YMG designed, coordinated, and provided several volunteers for one of the night’s four activities. Students were provided with base bridges made with k’nex pieces and creatively built bridges that could span 32”– learning the basic concepts of relative strength of shapes, triangles, symmetry, stability, and buckling along the way. 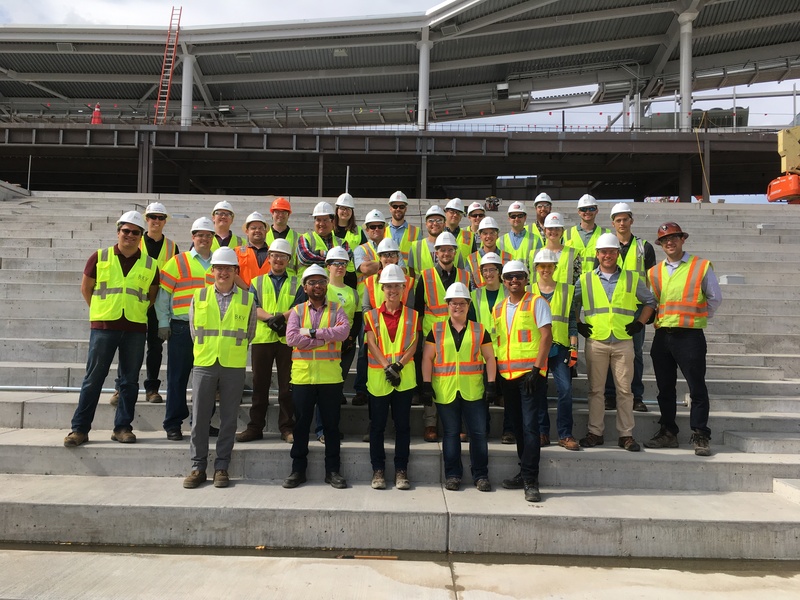 The MNSEA YMG partnered with ASCE MN for a tour of the new Terminal 1 Silver Ramp, a 5000-stall CIP post tensioned parking structure. Kimley-Horn (EOR) and PCL construction representatives gave a brief presentation about project design considerations before the tour, specifically focusing in on the geostructural design required to bridge over the Blue Line LRT station underneath the parking structure. 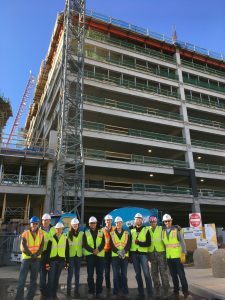 On site, tour participants were able to climb to the (current) top level of the ramp, watch a helix pour, and ask questions of both site engineers and a PCL construction supervisor. Participants enjoyed a happy hour at the new Intercontinental Hotel after the tour. 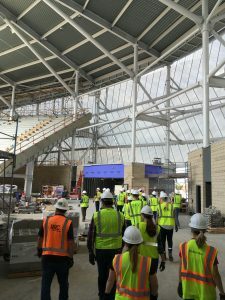 The MNSEA YMG was able to tour the new soccer stadium, Allianz Field, in St. Paul. 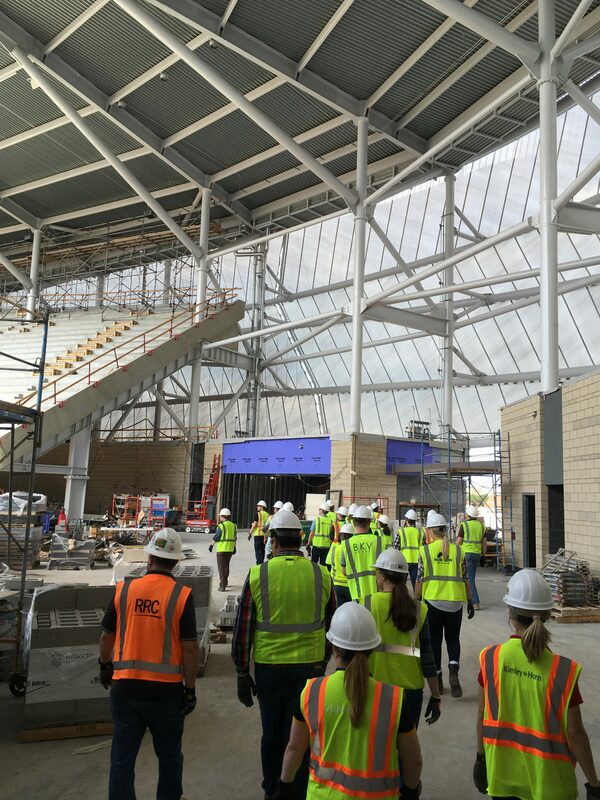 While there we had the unique opportunity to see the inside of the stadium and talk with the general contractor on site. 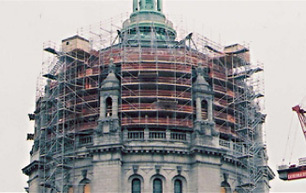 One of the MNSEA YMG’s core goals is to alleviate the steep and difficult learning curve for young structural engineers. That’s why we hosted “First Year as an Engineer,” an event designed to highlight some of the key challenges facing new and pending graduates. We received wisdom from seasoned engineers who gave us advice while going through this nerve-racking transition – the unknowns, the trials and errors, the new challenges. 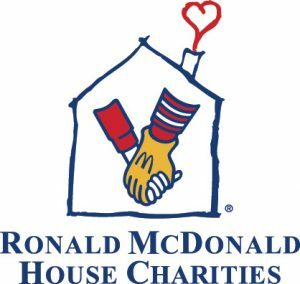 The MNSEA YMG volunteered alongside students to prepare, cook, and serve a meal for families at the Ronald McDonald House. 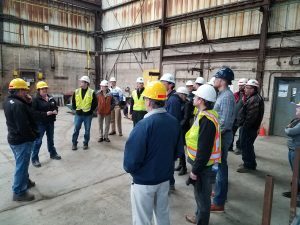 MNSEA YMG took a tour of the AZZ galvanizing plant in north-east Minneapolis followed by a happy hour at a local brewery. Members of our parent group (MNSEA) were invited to this event. Members had the opportunity to see the preparation of steel as well as steel being dipped into a kettle of zinc alloy that was a whopping 850 degrees Fahrenheit! AZZ staff was present to answer questions that members had. This is the second time the MNSEA YMG group has toured the plant. The previous tour was in 2016. The MNSEA YMG collaborated with the AIA-MN Emerging Professionals to do a trivia night at a local brewery in Minneapolis. The 14 attendees broke up into teams that had both Engineers and Architects. The teams competed against each other and the other patrons. 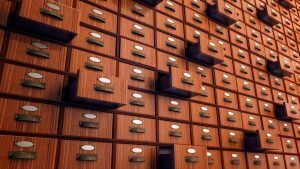 The questions were broad in scope, ranging from song titles to famous Harvard graduates. Therefore, teammates had to work patiently with each other and communicate efficiently to be successful. This was a ‘take-home’ lesson we can all use when working on projects together, now and in the future. Each team did very well in working together, however only one team could win in the end, and were awarded the gift cards for coffee (brain fuel)! Those who didn’t win will have to practice up with their new crossword puzzle books. This event was the first of hopefully many collaborative events to come with these two young professional groups. 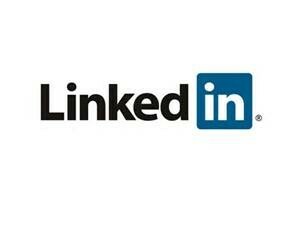 Maybe in future we can add contractors into the mix as well! Thanks to Mattson Macdonald Young for hosting the YMG for this seminar and member appreciation event. We apologize that technical difficulties kept us from watching the welding webinar, however we felt the AISC webinar “SteelDay 2017: Designing in Structural Steel” was a good substitution. 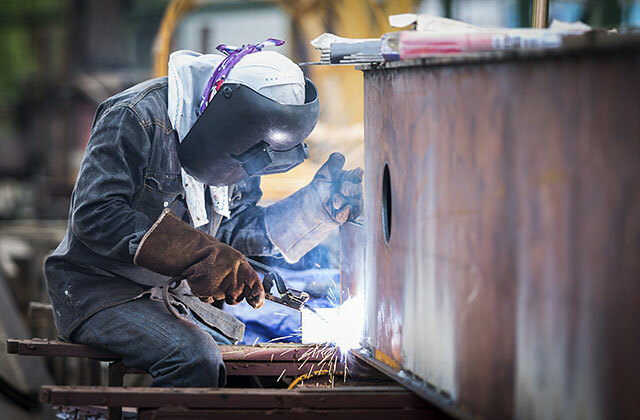 This webinar identified key changes to the 2016 AISC Specification for Structural Steel Buildings, Code of Standard Practice, and Steel Construction Manual. Thank you to everyone who participated. 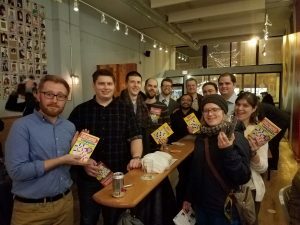 The event was followed by a happy hour at Pryes Brewing to celebrate winning the NCSEA YMG of the Year for 2017. The committee thanks all members again for their continued support and participation in making this group a successful one!